Thank you SO much! We received our bear in the mail today. My daughter is thrilled. We told her the lady must have found her and given her a bath and fixed her nose. She is so excited. Your service is a blessing to so many little ones. 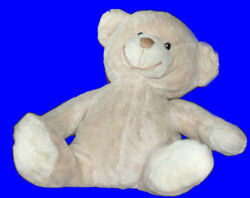 We are desperately looking to replace “Brown Bear” who was lost and asked for constantly. It’s by “Koala Baby” and was sold at Babies R Us. If you can help Peter find this Koala Baby light brown baby bear, THIS SITE IS NO LONGER ACTIVELY MANAGED. Please use Our FREE FACEBOOK GROUP, including #040108-1 in the subject, . Please be sure you use an email address that is correct, and that you will be using for a long time!! I can’t help you if I can’t contact you!! That includes those who post comments as Anonymous. No, this one does not have the white tummy. I saw that one, too. I hate to get their hopes up, since you don’t know how long it will be before you have a chance to look for it. Maybe someone else will find one sooner. But I sure do appreciate you letting me know about yours. PS I edited you post to change your email address to a slightly safer way of writing it on the internet. It is supposed to be harder for spam bots to find that way.